Before its rebuild, this 150-ton Minster automatic press had run at a mere 20 strokes/min. on some jobs. Newly rebuilt and outfitted with a new control, the press now runs no slower than 45 strokes/min., and as quickly as 85 strokes/min. on parts that had been running at 30 to 40 strokes/min. Stamping these clutch handles in a two-out die once caused huge headaches for the Ariens pressroom. 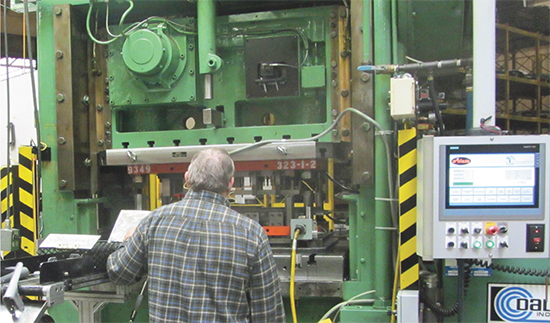 By adding a dual-part-out sensor, with data managed by the newly added Toledo press control, the firm expects to save $250,000 per year in scrap and die repairs on this press alone. It is these four automatic mechanical presses, which together run 25 percent of the company’s 500-plus dies, that have received Paplham’s recent attention, starting with the refurbishment of a 150-ton 1976-vintage Minster. When Paplham speaks of performance, the first things that come to his mind—pre-press overhaul—are the long setup times and pesky (and often costly) die crashes that plagued the press. In May 2013, the timebomb exploded. Paplham describes how the fuse was lit. 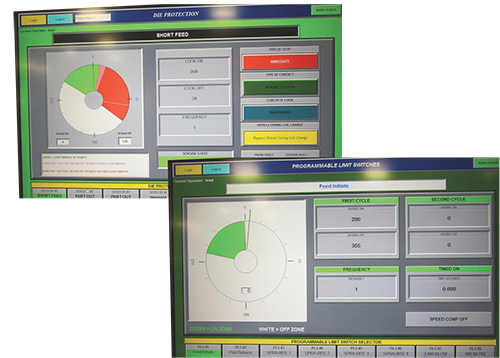 “The control has standard screens for die protection, programmable limit switches, tonnage monitoring, etc… however, Ariens also can modify the look and feel of the interface screen to its liking. Paplham and his team were able to customize where each piece of data appears on the control screens, and the types of charts and graphs used to display the data. “We also find that the Toledo interface simplifies feed-line integration,” Wenzel continues, describing the special servo-feed interface developed for use with the Dallas ProfileSelect feed control. The control was modified, he adds, to perform basic mathematical functions for Ariens operators, to simplify setups. BDC also installed, as part of the press-line overhaul, a new Spra-Rite die-lubrication system from Industrial Innovations. 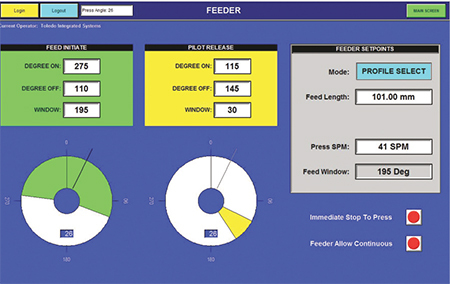 The Toledo servo-feed interface, developed for use with the Dallas ProfileSelect feed control, eases feed-line integration. The control was modified to perform basic mathematical functions for Ariens operators, to simplify setups. Now the upgraded Minster runs 55 different tools for the Ariens press shop. Each is equipped with part-out and short-feed sensors. “And we’re looking at adding in-die part measurement to some of the tools as well,” says Paplham. Since upgrading the press, die crashes nearly have been eliminated, Paplham says, and the control makes troubleshooting a breeze. The control communicates information that allows Paplham’s maintenance team to quickly diagnose any issues and get right to work addressing them. In all, Ariens invested $220,000 on the press-line upgrade, justified easily, Paplham says, just by being able to protect the press from damage from short feeds and other faults. Add in the eliminated die-repair costs—replacement punches, labor, etc.—as well as the increased production and “we’re way ahead of where we thought we’d be in terms of speed and press uptime,” Paplham continues. When installing and setting up the refurbished press line, BDC worked with Toledo to establish five levels of access to press-control parameters via the Toledo control. Employees use unique ID cards rather than access codes, which can too easily be learned by others over time, says Wenzel. 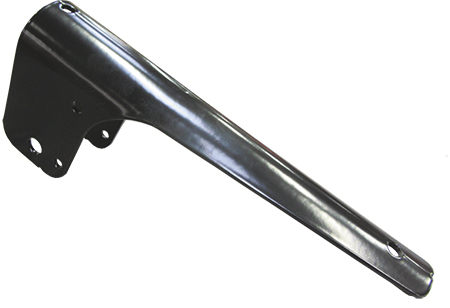 Operators cannot adjust the press—only a tool and diemaker can access settings such as shut height. And the maintenance group at Ariens also has its own unique level of access. On the horizon for Ariens, according to Paplham: “Creating reports from our desktop computers, using Ethernet access to the press control. That added integration and access to data will help us pinpoint additional paths to improved productivity.